Keeping potential gaffes to a minimum has been one of many reasons for Obama’s success this year, forcing the wing nuts to dwell on trivial matters such as a washed up terrorist who, along with Republicans, was on some of the same committees with Obama. There’s good reason why the late night comics have been making fun of the Repubican ticket seven times as often as the Democratic. Posted in Barack Obama, Entertainment & Leisure. 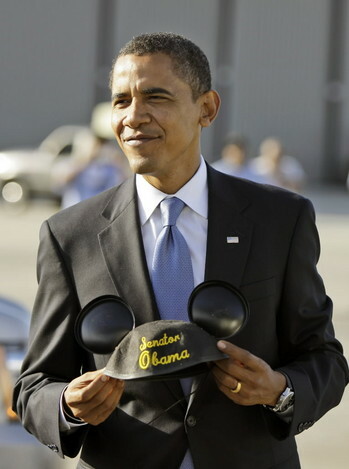 Tags: Disney, Republicans, Walt Disney World. RSS feed for comments on this post.. TrackBack URL. T-minus two weeks to election day. Vote NO on Proposition 8 in California. Check this vid of Iger, CEO of Disney, refusing Mickey ears during Mickey’s birthday celebration on The View.